Find potential sales leads in seconds when you buy and download our Canadian chief technology officer (CTO) and chief information officer (CIO) email database. Obtain the names, numbers and addresses of industry professionals in your target audience with our B2B email list. IT executives in Canada, such as chief technology officers (CTOs) and chief information officers (CIOs), possess business knowledge, leadership skills, and a strong understanding of technology. While a CTO is typically involved in the creation of technology to sell to customers, a CIO manages the infrastructure for business operations. Our Canadian CTO email list allows you to connect directly with these strategic thinkers with a primary objective to make more deals and secure sales leads. This Canadian chief information officer mailing list contains numerous email leads as well as other means of communication. Our CTO and CIO email database contains important contact data like names, phone numbers, fax numbers, addresses, and more. When you buy and download our affordable and verified B2B email list, you can build a simple directory of highly qualified professionals in your target industry and leverage targeted sales leads. 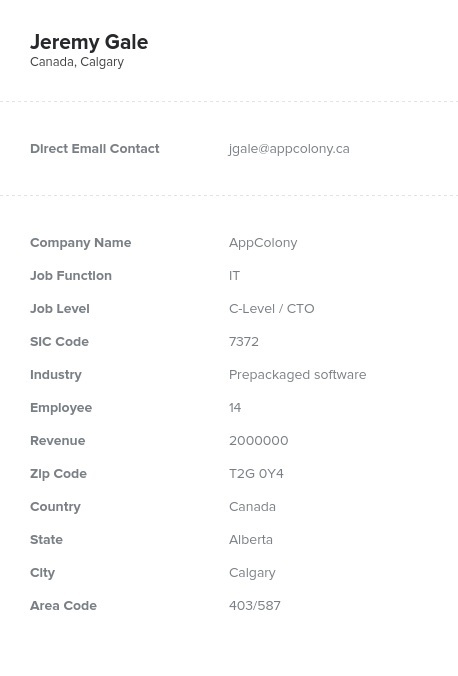 We offer ready-made Canadian CIO and CTO email lists as well as access to our list-builder tool, which you can use to easily build your own business database containing expert chief information officers and chief technology officers narrowed down using factors such as company size and specific location. Buy and download our business contact list and begin pursuing sales leads today!